Algae farms and installation are one of many examples of the booming and rending of this amazing seaweed. Out author Itai Lahat illustrates how diverse the usage of algae already is. It may not be very pretty to look at, but this urban algae desert farm on an overpass in Geneva, Switzerland is doing a remarkable job. Installed by the French and Dutch-based Cloud Collective, it was one of 13 displays at the Genève: Villes et Champs garden festival over summer, 2014. A solution of algae moves through the system of transparent pipes, feeding off the carbon dioxide expelled by the cars on the highway below. The installation was designed to demonstrate that even the bleakest of urban environments can be used to grow an abundance of biomass for food and fuel production. The system of transparent tubes is attached to the concrete siding of a viaduct highway overpass that also does double duty as a pedestrian and cycling path. A steel structure supports all the secondary equipment such as pumps, filters and solar panels, and also functions as a marker for the passing traffic below. Didactic panels provide detailed information on the project for pedestrians and cyclists on the bridge. The project heralds a possible future for urban farming: a future that includes food and fuel production, the conservation of greenfield sites and the repurposing of existing infrastructure. The algae pipe installation is one of many examples of the booming and rending of this amazing seaweed. 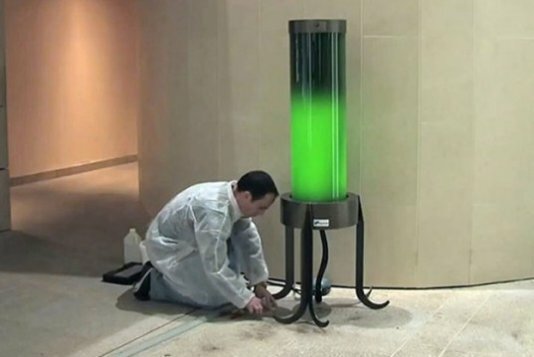 Dutch designer Nieke Hoogvliet recently demonstrated a most unique design with the green stuff of algae. 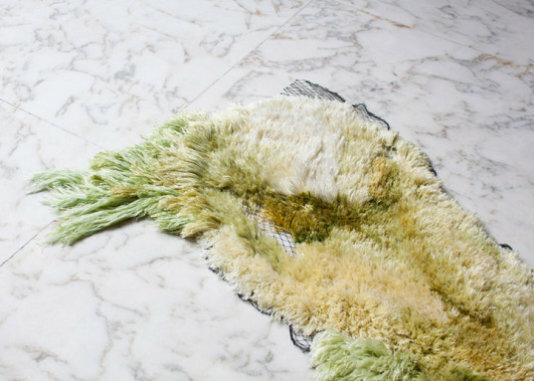 Using yarn made from kelp, Hoogvliet created a gorgeous green rug. The Sea Me algae rug demonstrates an environmentally friendly alternative to viscose production, and its fibers are even softer than commonly used materials. Another use demonstrated was done by French biochemist Pierre Calleja has designed a fascinating eco-friendly lamp that could light up streets and parking garages while cutting CO2 emissions. It runs completely free of electricity, powered solely by a tube filled with glowing green algae. The lamp uses the energy created by the algae’s own photosynthesis process to power the light within, while the algae itself lives on CO2 in the air outside. More promising uses include algae planes. European aerospace company EADS, or Airbus, has invented an algae fuel-powered aircraft. The company’s twin-engine Diamond DA 42 runs partially on biofuel made from 100 percent algae. The plane requires 1.5 fewer liters of fuel per hour than conventional fueling systems because of the algae’s ultra-high energy content. EADS has high hopes for algae-powered planes in the future, but the company hasn’t yet revealed when these hybrid planes might be commercially available. Algae even made its way into the construction industry. 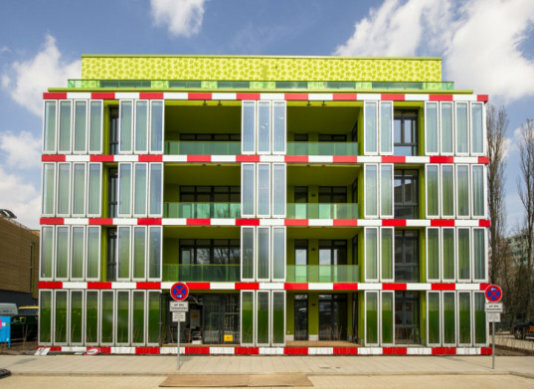 Splitterwerk Architects have designed the world’s first algae-powered building, which is clad with a bio-adaptive façade of microalgae. To create the façade, the building is covered in bio-reactive louvers that enclose the algae. These louvers allow the algae to survive and grow more quickly than they would otherwise while also providing shade for the interior of the building. Additionally, the bio-reactors trap the heat energy created by the algae, which can then be harvested and used to power the building. Photosynthesis is driving a dynamic response to the amount of solar shading required, while the micro-algae growing in the glass louvers provide a clean source of renewable energy. Green Algae: Can it Really Fuel Your House? Will this kill the hybrid-electric car? Development at the expense of climate change? Can you see the future through this window?